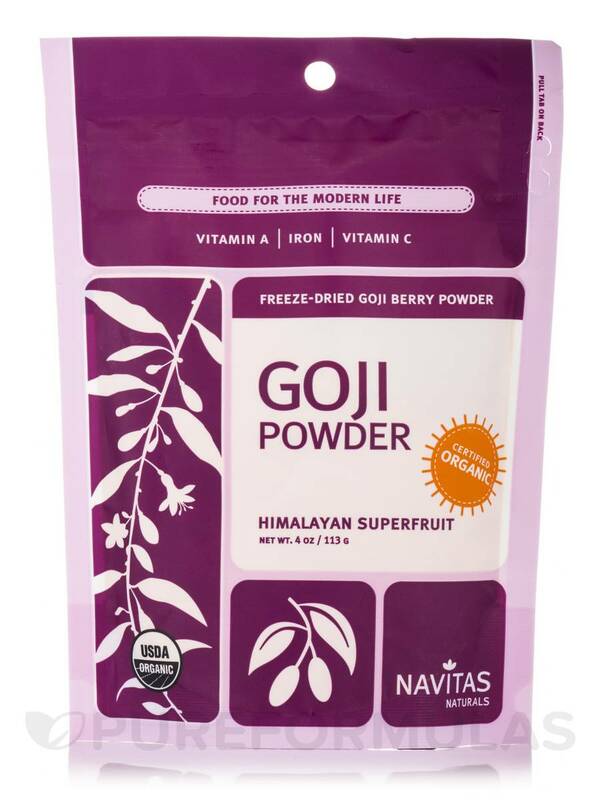 Goji Powder from Navitas Naturals are made from whole goji berries from a province in China. They are freeze-dried and milled into a fine powder which you can add to your foods and beverages. It may possibly have as many benefits as the actual whole berry. It’s believed to be easier to use and more digestible. The goji berry (also known as the wolf berry) has been well known in Traditional Chinese Medicine for over 2‚000 years. These berries are believed to contain an array of antioxidants‚ essential amino acids‚ carotenoids‚ and over 20 vitamins and minerals. They may possibly contain more vitamin C‚ beta-carotene‚ and iron than most other foods. Goji berries are also believed to be a great source of protein‚ healthy fats‚ carbohydrates‚ and fiber. 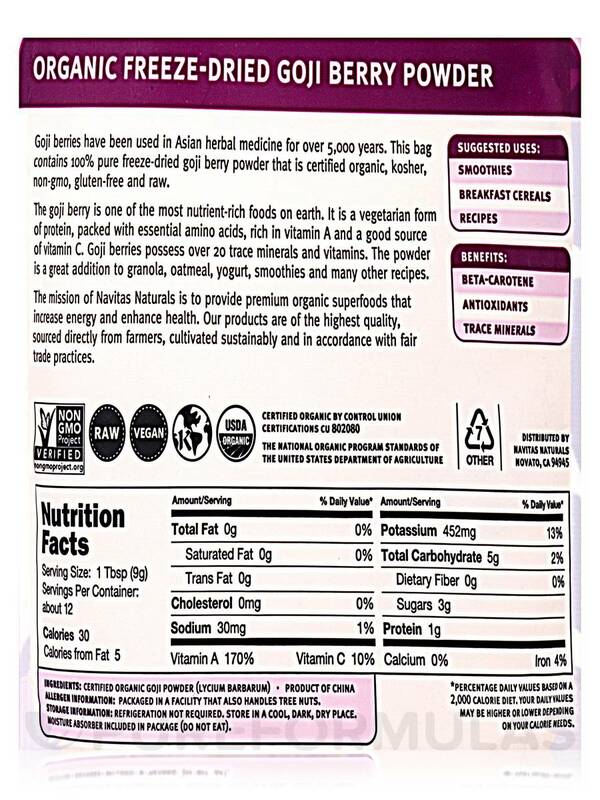 Navitas Naturals’ Goji Powder is certified organic‚ non-gmo‚ gluten-free‚ raw‚ and vegan. You can easily add a scoop of it to your smoothies‚ shakes‚ yogurt‚ or any batter for baked goods. 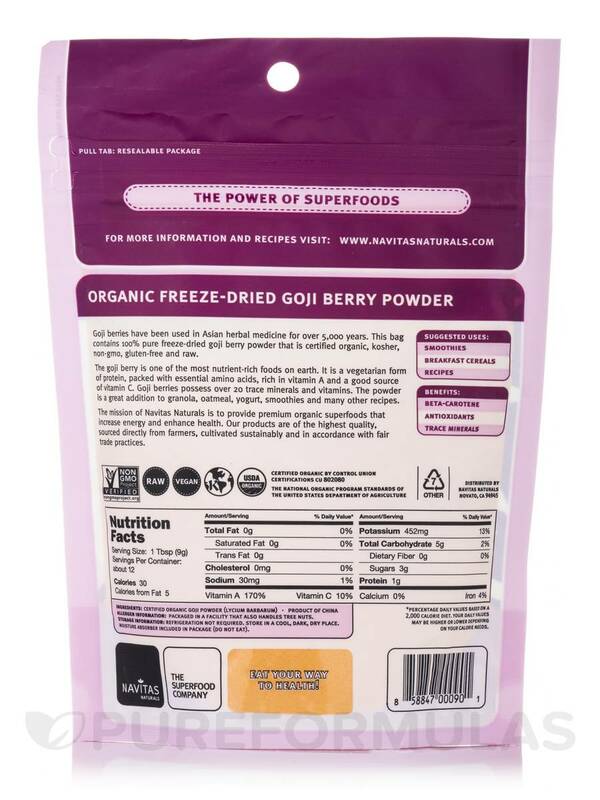 Ingredients: Certified Organic Goji Powder (Lycium Barbarum). Product of China. Allergen Caution: Packaged in a facility that also handles tree nuts. Store in a cool‚ dark‚ dry place.